Chayote, also called chayote squash (it is from the squash family), choko, vegetable pear, mirliton and christophene, is a beautiful pear like shaped vegetable. Ironically, it has a texture similar to a pear that isn’t ripe, but less grainy. Yet the chayotes isn’t wholly sweet, it just has a sweet hint, barely a whisper, really. Its flavor is more neutral, like a cross between a pear and a cucumber… and zucchini. Well, you just have to give them a try. 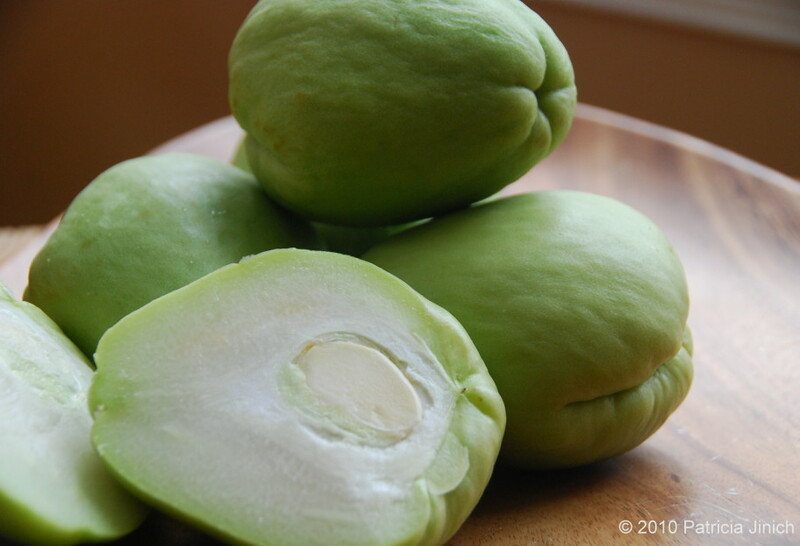 Crispy, watery, very low-fat, with a clean and wholesome feel, chayote can be used many ways. Most typically in soups, as a warm vegetable side, a cold salad or very popularly stuffed either with a sweet or savory spin. They are most times cooked and best al dente, unless eaten stuffed. There are different kinds of Chayotes. These here in the photo are probably the most common, and the easiest to find outside of Mexico. They are mild, with a mild green color and a mild, friendly and accommodating flavor. There are some that have a darker green color, and even purple tones, with thick and short thorns throughout their skin. Chayotes tend to store well. They can last for more than a couple weeks in the refrigerator. Hi Pati! My husband and I are watching religiously your show and trying many of your recipes. We remember that you prepared, in an episode, a diced chayote salad but I’m not able to find it in your website and it wasn’t the «chayote squash and pickled onions salad». Can you figure the one I’m talking about? Thank you so much for helping us to cook easily mexican cuisine! My husband made the chayote salad 🥗. We watch your show together . Thank you for watching and for ordering the cookbooks! I hope you continue to enjoy all of the recipes! I just watched an episode with you cooking with chayotes and then saw them in the store. So I bought some and I am going to try them for the first time, way up in Minnesota. Love your show. Yay! If you like pickled onions try them this way: http://patijinich.com/recipe/chayote-squash-and-pickled-onion-salad/ It’s one of my favorite ways to cook chayote! Have you ever tried chayote rellenos (we call them Guisquiles Rellenos in El Salvador)? They are to die for! I like them raw. I simply peel them and chop them into sticks. Eat them as is, serve with a dip or toss in a salad or slaw. I keep meaning to try them boiled but eating them raw is so easy and tasty I’ve never managed to do it. I would also mention that the seed is soft and completely edible. Do you have any recipes that use it raw or marinated? I find it hard to slice or dice. I usually eat them steamed with salt and pepper. I would like to try fhem raw. How do you do it? I made them or my 8 year old daughter and she loves chayote! I’m looking for a chayote salad recipe from the TV show, about a month ago. I haven’t found it on the website. Is it available? i had this a long time ago, Pati at a Costa Rican friend’s home in Rome- he smuggled it past customs on his trip back from Mexico City! Would love to see a recipe of yours here. It’s a coincidence for me that you posted about chayote. I just read that it is the time of year here to plant them here, but I’d never heard of it before. From your image, I realize I’ve seen it, but I’ve never eaten it. Glad to learn something new. Thanks.